Long well established as live performers, their first studio release Surface (2009) was "startlingly fresh". 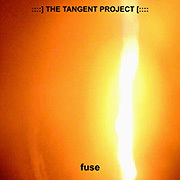 Three years later The Tangent Project returns with a CD you did not even know you were waiting for. 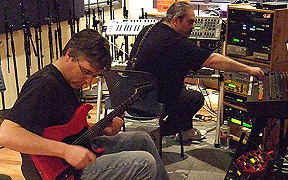 On Fuse, Jeff Coulter (synthesizers, sequencers) and Harrison McKay (electric guitar) explore their artistic vision for yet another entire album. The six tracks require an audience who has the ability to comprehend something vast - the musician makes it, but this music in fact lives in the listener. Fuse tacks in interesting ways. Coulter and McKay create an intriguing reel of skull cinema that flickers and flutters across a range of electronic hue, contrast and mood. Vividly atmospheric the sonic identity of Fuse shifts from serene to possessed. Clashing bursts of sound interact to create powerful abstract dramas while elsewhere quieter dimensions provide a psychoactive undertow and a welcome gentle space. From this uniform state arises structure. Vertiginous sequencer patterns, interlocked with echoing guitar, thrill us with motive force. These pieces deliver a soundtrack-like experience, enhancing visions of crushing urban life or a tribal jungle hunt - before disintegrating into a swirl of unanchored abstractions. This music is patterned over both time and space. After 80 minutes and many light years under The Tangent Project's spell, it will be hard to return to the familiar air and rhythms of everyday life.